The first step in constructing and launching a successful brand is to plan and strategize. Begin by brainstorming to come up with a unique and easy to remember company name. The more relevant your name is to what your company offers and the more memorable, the better. Using different techniques like acronyms, abbreviations, or a combination, and playful and descriptive words, your company’s name is more likely to catch your consumer’s attention and attract them to your business. Remember to focus on who you want your target audience to be. For example, a financial company would most likely want to present themselves as professional and trustworthy. When developing a logo for our client Business Finance Capital, we chose a more balanced and sophisticated design. It’s important to research your competitors, as well, in order to differentiate your brand from the crowd. 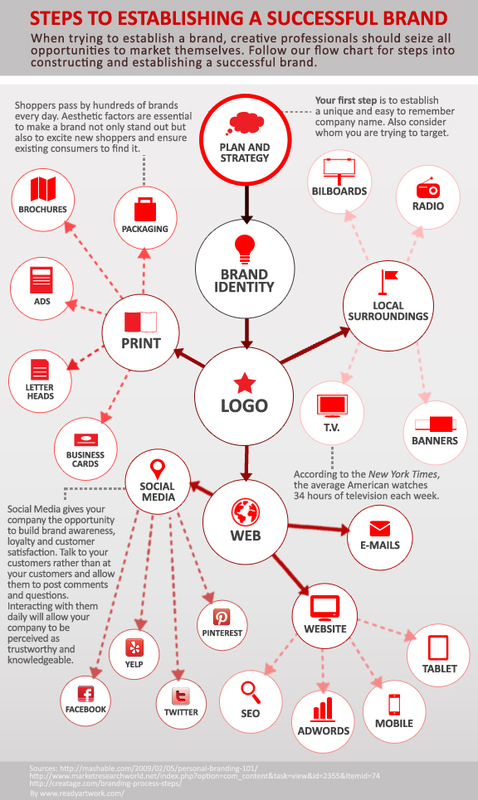 As you develop your brand, you’ll want to think about brand identity. Brand identity involves all the visible elements of a brand, such as color palettes, fonts, layouts, and measurements. These elements will determine how the company would like to be perceived as a whole. After picking all the visual elements, use these guidelines to design your logo. Choose memorable symbols or icons that will give your logo the attitude it needs to stand out from the crowd of competitors vying for your audience. Once you have established a plan for your business, you will definitely want to have a website to educate your customers about your brand and the types of products or services you offer. Your website will act as a portal for your customers to call, email or find directions to your business. Today’s consumer is very web savvy, they know how to search for your brand on major search engines, such as Google or Yahoo. If you don’t have a website that’s easy to find online, your business will be at a huge disadvantage. Now that you have a plan, a logo and a website finalized, start advertising your brand using print, web and local surroundings. The most popular way to advertise is the use of social media websites. Social media gives your company the opportunity to build brand awareness, loyalty and consumer satisfaction on a free platform. Take advantage of the platform templates and design them in a way that will appeal to your target audience. Using design techniques, such as infographics, design unique contests that will encourage your consumers to interact with your company and product. Remember that a good design contains a hierarchy; certain words have a deeper significance than others and can be expressed in a larger and bolder font. It may seem like social media is the it factor, but don’t let that fool you, print advertising is still an effective and eye catching way to draw your viewer’s attention. Holding a paper ad and interacting with it feels more sentimental than simply viewing it online. If you continuously deliver weekly newsletters or ads, your consumers will not only remain aware of your services, but also create a positive association between the consumer and your brand. When designing your print ads, choose specific colors, fonts and paper texture to appeal to your audience. Remember to also have a strong focal point that will not only dominate the ad, but also connect the ad all together. Following these steps and using all your advertising tools, like web, print and social media, you will soon establish a unique and strong brand. Always remember that consumers are looking for the different and the unexpected, so be sure to use design elements that will make your brand stand out distinctly from others in the very busy and crowded marketplace. If you are in the process of developing a brand for your own company, we can help! Call us (626) 400-4511 or visit us for a free quote on a logo and brand identity design!